Valentine Hearts arriving for the 14th of February. These are just samples of items we have pre-ordered for Valentine's day. We maintain a limited quantity of these and other items in our store. We also have catalogs for special orders. All items in stock can be ordered for pickup later or in some cases created while you watch. 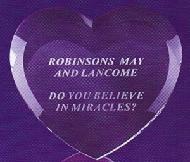 We also will have heart shaped Keychains for etching - they will cost $4.95 each. 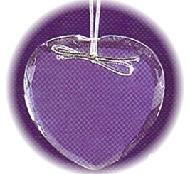 We have them in mirrored or plain acrylic, double or single heart shaped, and in assorted colors including neon. All items are first come first serve - when we are out of stock - we will re-order. Sorry - no 'holding' items without pre-paying for the item. Hold that thought! And hold it on something nice. 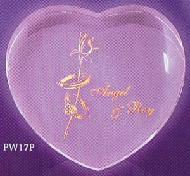 Acrylic Heart keeps the crucial notes and important papers firmly in place on you desk. And why not have a little place for a simple flower bud to add a smile to your face. Lasting memories. Unfortunately special events do not last for ever, but the memories can. 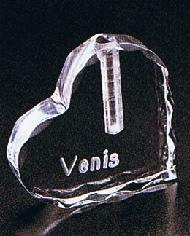 Capture them on this beautiful Acrylic Heart with base. Over all size is 6 inch by 6 inch. One of our original pieces we carried through Christmas. We've ordered more to make Valentine's day a bit more special for that someone special at a new even more affordable price. It's not just for Valentine's day, but you can put that special message or photo on a small crystal keychain with LED light for many uses. Not only does it make the image pop out when lit, it can be used as a mini-flashlight. 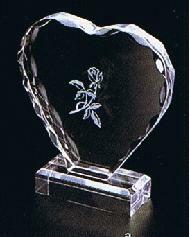 Another paper weight - but this one has beveled edge to give the heart a smoother appearance as it sits on your desk. 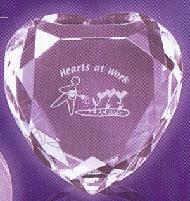 Another paper weight - but this one has the fine cut "faceted" edge to add that extra elegance to the heart. 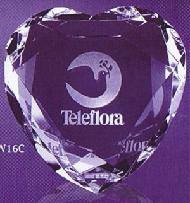 It comes in Clear Crystal or Pink Crystal. These crystal bud vases are like the heart above, but square. They are four inches by four inches to allow for a large message or photo to be placed on one side or the other. Plain and simple - it's a paper weight. It's one inch thick and four inches by four inches in size. It's the largest paper weight we'll carry for this year's valentine's day. Posted prices are subject to change without notice. 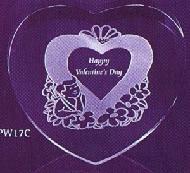 Please understand that we are ordering a limited quantity for this first Valentine's Day in the store. Special orders for sold out items will have a four day delivery time from California unless customer request to pay a rush fee to cover the additional cost of overnight shipping.